Looking for an excuse for a party? [Spark of inspiration.] A birthday party for NAFTA will bring a spark of fun to a drab January! Twenty years ago, NAFTA (North American Free Trade Agreement) was born. NAFTA has changed North America, so let’s review who, what, where, when and why before we celebrate! North America = The United States of America, Canada, and Mexico. Free Trade Agreement = Elimination of trade barriers. North America said goodbye to many tariffs (AKA taxes changed upon import /export). Because its annoying to have to pay to use our roommates stuff. Not that I support stealing from our roommates. But if it is an accepted fact that my roommate and I are going to swap stuff, then an agreement should be made to make this happen as cheaply as possible. The U.S., Canada, and Mexico were constantly swapping stuff and wanted to save $$, so they created NAFTA! We should all be very happy that the U.S., Canada, and Mexico are besties. 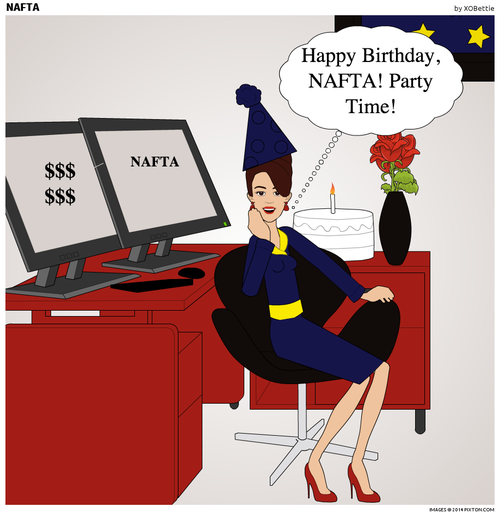 Have fun celebrating NAFTA’s Birthday!